Scott had played for Musselburgh Athletic and then Hearts, Aberdeen and Watford with a loan spell at Kilmarnock before he joined United. He was frequently in the line up during 2010-11 but an injury in the early stages of the next campaign forced him to retire and he left United in March 2012. Scott was born on this date in Stirling. For the first ‘New Firm’ derby of the season, manager Peter Houston made three changes from the side that had been so close to registering the first elusive win of the season at Tynecastle. Transfer deadline signing Scott Severin made his debut on the left-hand side of central defence partnering Garry Kenneth, while Sean Dillon switched to right-back to the exclusion of Keith Watson. In midfield, David Robertson was a straight swap for namesake Scott and Morgaro Gomis started in place of the injured Danny Swanson. Matches against Aberdeen are always eagerly anticipated and with their supporters having travelled in good numbers, there was a real derby atmosphere come kick-off. Peter Houston made four changes to the side which had lost 4-0 at home to Rangers mid-week. In came Barry Douglas, Keith Watson, Prince Buaben and Craig Conway in place of Johnny Russell and the suspended trio of Sean Dillon, Morgaro Gomis and Mihael Kova?evi?. Dundee United were now officially beginning life after David Goodwillie following the Scotland international’s £2.8 million move to Blackburn Rovers. 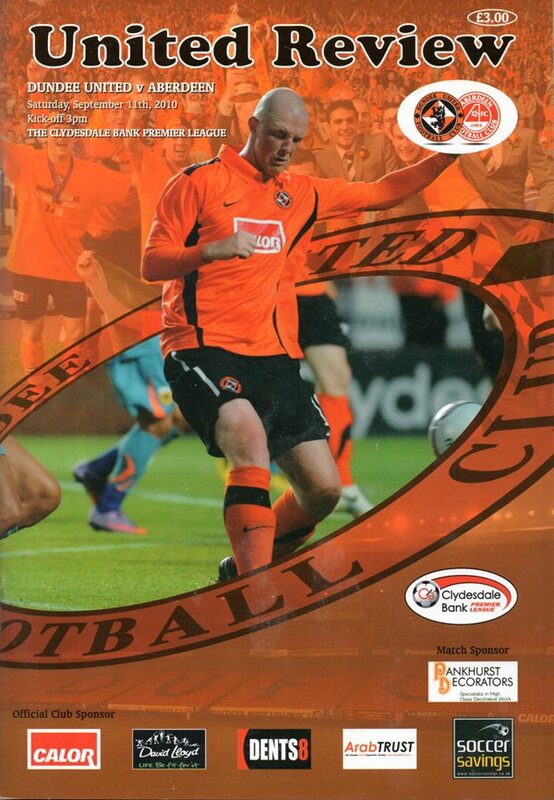 Peter Houston’s side weren't daunted by the challenge however having secured a win at Tynecastle the previous weekend without the services of Goodwillie and they looked to continue their unbeaten start to the 2011/12 SPL season with a result against St Mirren at Tannadice. Houston named an unchanged line-up for the visit of the Buddies following his side’s impressive performance against Hearts with promising young midfielder Scott Allan retaining his place in midfield.